As of 4:40 am, the front edge of the line of storms have now reached the east and east-central parts of North/Central Alabama with the northern part of the line becoming weaker as we go through the early morning hours, but it is a different story for the southern parts of the line. A tornado warning continues for parts of Shelby County until 5:00 am for a cell that is located just to the west of Columbiana for possible rotation. It was moving to the northeast at 35 MPH. The rest of the line, while producing gusty winds and dangerous cloud-to-ground lightning, is below severe criteria at this point. Instability continues to drop as now much of it is located over the eastern half of North/Central Alabama, in the 500-1000 J/kg range. Bulk shear values have dropped to 55-65 knots. Helicity continues to be in the 300-600 m2/s2 range. STP values are in the 1.0-3.0 range for the eastern half of the area. Severe storms with rotating updrafts continue to be possible east of I-65 in the northern half of the area, and just west of I-65 in the southern half. Shelby, Bibb, Jefferson, Perry, and Blount counties are about to be dropped from the tornado watch at 5:00 am. 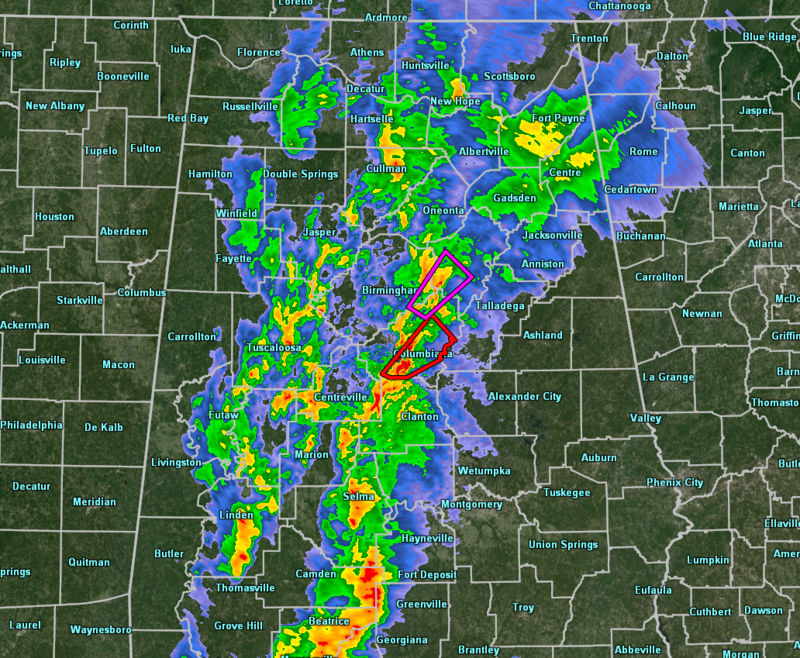 GOOD NEWS… tornado warning for Shelby County has been canceled. Scott Martin is a meteorologist, graphic artist, musician, husband, and a father. Scott is a member of the National Weather Association and the Central Alabama Chapter of the National Weather Association. Scott is also the co-founder of Racecast Weather, which provides accurate forecasts for many racing series across the USA.